On November 8th, the United States will be electing its 45th President. This year's race for the White House and the events leading up to it have been unlike elections in the past. With what many say are the most polarizing candidates ever to land on the US presidential ticket, what impact has the upcoming election had on Alliance members and their organizations? The 451 Alliance recently surveyed 995 respondents regarding the impact of the election and main party candidates on IT spending and the US and global economies, if either were to win this year's election. Elections, and the period leading up to election day, are unique times. Historically, presidential election years involving candidates who are not seeking re-election spell uncertainty and negative market returns. Workplace decisions can be prolonged or impulsively made. The majority (92%) of respondents reported that they work for a US-based organization. About 8% work for an internationally-based organization, with most reporting Europe or North America. Last 90 days. Respondents were asked how the upcoming election has impacted their organizations' IT spending over the last 90 days - at the time of state primaries, caucuses, national conventions and party nominations. During this period, both the Democratic and Republican parties experienced intense discord and unpredictability. 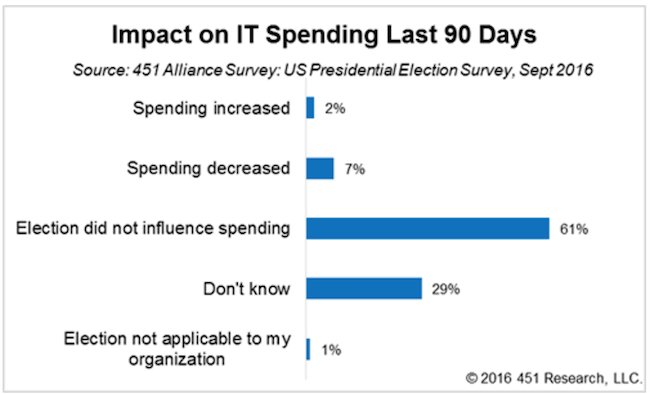 Most respondents, 62%, reported that the election did not influence IT spending over the last 90 days. Nearly 29% don't know if the election influenced spending. About 7% reported that IT spending decreased while 2% said spending increased. About 1% said the election was not applicable to their organization. Current spending. What about now - when the candidates' campaigns are climaxing and all eyes are on the Presidential debates? A time when uncertainty is at its highest, and US markets want a resolution so they can return to normal. During this particular time period, about 59% of respondents reported that the election is not having an impact - spending remains the same at this present time. About 27% don't know if the election is impacting spending. Just 2% said they are currently spending more. The total percentage reporting a hold on spending is higher than those reporting a decrease 90 days ago (12% vs 7%): 3.4% said their organizations are currently holding back spending, 4.4% are holding back spending pending the outcome of the election, 1.9% are holding back spending until the end of the year, and 1.8% said spending is suspended until 2017. 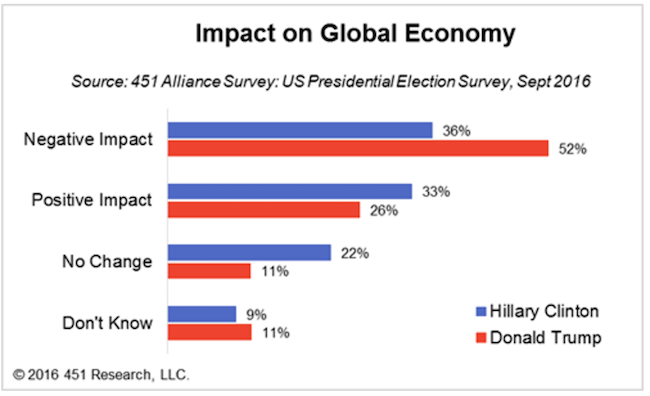 Respondents were asked what impact either candidate would have on the US and global economies if either were to become the next US President. US Economy. 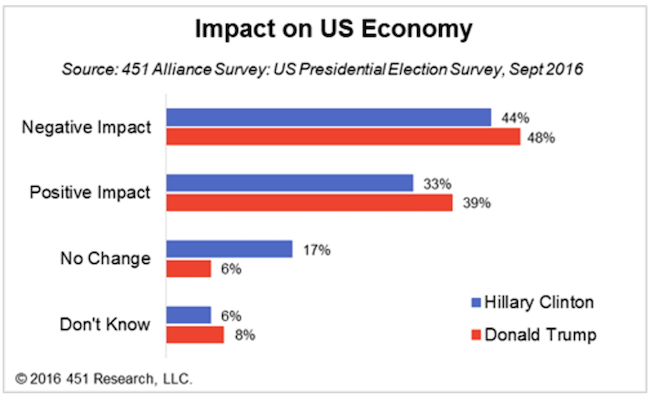 In terms of the US economy, about 44% of respondents felt that the Democratic candidate, Hillary Clinton, would have a negative impact if she were to become President. Another 33% felt that she would have a positive impact. Surprisingly, 17% said there would be no change if she were elected. If the Republican candidate, Donald Trump, were to become President, about 48% of respondents felt that he would have a negative impact on the US economy. Another 39% felt that he would have a positive impact. Only 6% said there would be no change. Global Economy. On the international stage, fewer respondents felt that Hillary Clinton would have a negative impact (36% global vs 44% US) if she were to win the election. Conversely, fewer felt that Donald Trump would have a positive impact (26% global vs 39% US). 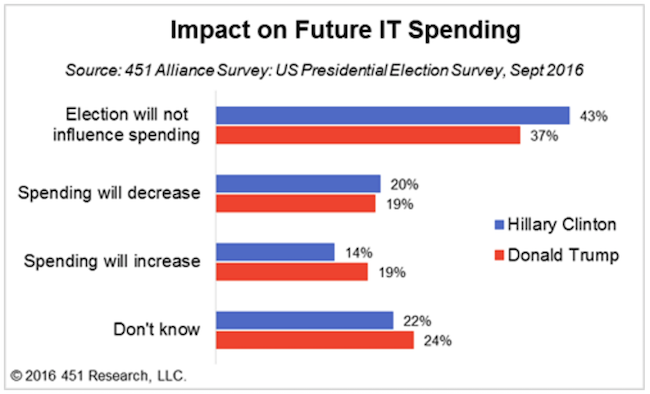 While 60% of respondents said the upcoming election was not having an impact on their organizations' past and current IT spending, nearly 30% of respondents were unsure about the impact of the election on spending. Looking forward when Alliance members were asked how the election of a specific candidate would impact their future spending, surprisingly a Trump win indicates a slightly more positive impact on future spending plans. If Hillary Clinton were to win the election, only 14% said spending will increase and 20% of respondents said that IT spending will decrease going forward. In contrast, 19% of respondents expect spending will increase if Donald Trump were elected, while another 19% said spending will decrease. To receive more articles like this, join the 451 Global Digital Infrastructure Alliance. The 451 Alliance is a member-driven 'think tank' comprised of a worldwide network of highly-qualified enterprise technology and IT professionals. The 451 Alliance tracks changes in corporate IT and digital infrastructure technologies well in advance of other sources and reports findings directly to its members. Thanks to our partnership we are able to offer our members a complimentary membership to the 451 Alliance. Membership includes access to 451 Alliance's weekly research reports and a bi-weekly newsletters. Join now!